2017 06 final four disappoint. After advancing out of our pool play on week one of the tournament we then travel up to Temecula for the knockout stage (win or go home, final 64 teams, March Madness - only in February). Our young ladies definitely came to play, winning round of 64, then round of 32, then the sweet 16 (besting our last year’s showing). Oh, how fun it was to watch! Now onto the final weekend and the elite 8 and what a battle it was. In the elite 8 our young ladies battled and battled and fought until the very end scoring goal in the 59th minute to go up 1-0 and WIN. The parents and kids full of joy. On to the FINAL FOUR OF STATE CUP! 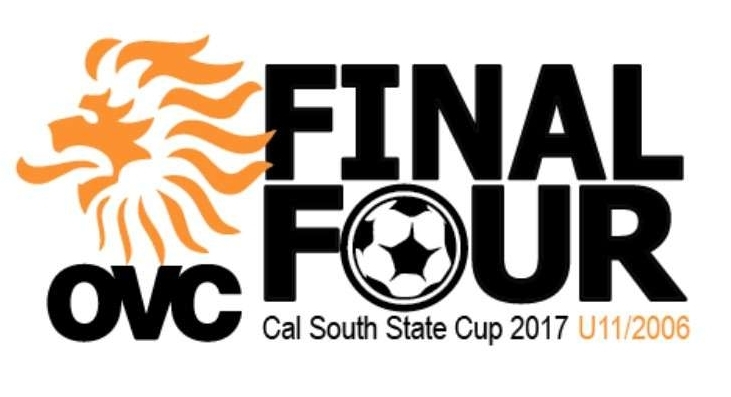 Yes, the final four teams in southern California (out of 128 teams) and the lone standing team from San Diego. I heard parents walking around saying "Who is the orange team? Who is OVC? They are from El Cajon -Where is that?". It was so cool to hear. Parents excited! Young ladies and Coach excited! Ready to go! The game was exciting, just as exciting as the elite 8. Legends struck first in the opening half and looked poised to hold the lead. We pushed and pushed, never quitting, playing to the final whistle. With Legends, up 1-0 with about 3 minutes to go our little ladies finally broke through and put the ball in the back of the net. The crowd went wild! Overtime here we come! After the first overtime, it was still 1-1. On to the second overtime. Then with about 4 minutes left the legends put one in the back of the net which propelled them to the Final game. TO SAY THAT WE ARE PROUD OF OUR GIRLS AND COACH IS AN UNDERSTATEMENT! WELL DONE! WELL DONE! SPECIAL THANKS TO THE PARENTS FOR ALL THE TIME AND SUPPORT YOU HAVE COMMITTED. WE LOOK FORWARD TO SEEING WHAT THIS TEAM BECOMES. UNTIL NEXT SEASON, “be ORANJE".